You must always be definite and consistent whenever you’re with your horse and you must have definite rules. When your horse does as you ask, you must always make things relatively easy and pleasant for him. When he isn’t doing as you ask, you must make things a little unpleasant for him. These rules must apply every time you’re with your horse. When your horse understands your rules and knows that you’re consistent, he’ll be able to relax because he’ll always know how to make life easy and pleasant for himself. The rules may be as simple as teaching your horse to stand when you ask, or to walk exactly where you ask, at the speed you ask. Or they may be as complex as teaching your horse to perform a canter pirouette. If you’re consistent through every level of training, your horse will be just as relaxed performing an advanced movement as he is when he walks a circle. The trouble is that near enough is good enough for many people. Their horse is allowed to wander along on the end of the lead and to look here and look there. There are no definite rules and many people don’t care if their horse walks over here or jogs over there. Yet, when the horse gets a ‘fright’ and jumps over the top of them, the same people yell and shout and hit the horse. In this situation, the horse has been allowed to make the decisions about where he walks and how he walks. The horse wanders along doing his own thing until, for some reason or other, he suddenly rushes forward and pushes over his handler, who promptly becomes upset and starts yelling and hitting. From a horse’s point of view, this makes no sense. One minute he’s allowed to do his own thing, and next minute he’s hit and yelled at. From a horse’s point of view, he isn’t doing anything different – just wandering along – and then, out of the blue, the handler hits him and yells at him. Due to this inconsistency, the horse becomes more nervous and more worried and pushes over the handler or pulls away more often. And next thing, people say that the horse has no manners and no respect. Saying that a horse lacks respect is just a way of blaming your horse instead of blaming yourself. And unfortunately, it’s often an excuse to apply excessive pressure and force on the poor old horse. Always make it easy and pleasant for your horse to do as you ask, and a little unpleasant for him to pull away or walk over you. Always remember that a horse pulls away or pushes over his handler because that’s what he’s been taught to do. Here’s the good news. You don’t need to yell and shout or apply excessive pressure. 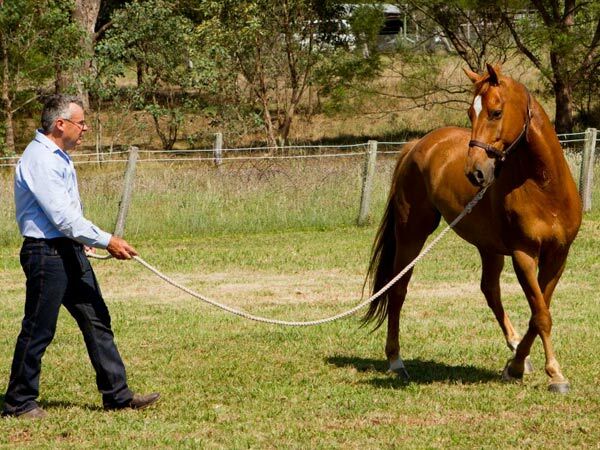 Simply work in a small area and teach your horse to walk an exact circle, at an exact speed. Always make it easy and pleasant for him to do as you ask, and a little unpleasant for him to pull away or walk over you. A sharp tug on an ordinary headstall at the right time, is all that you need to teach your horse not to push over you. You don’t have to be aggressive. He is the author of Fear-free Horse Training – every step of the way. Visit Neil’s website at www.fearfreehorsetraining.com.